Buizen: C142 , F215 , D143 , 2504. Ansichtkaart uit 1977 ter gelegenheid van de vijftigste verjaardag van de 2501. Broadcast reception of 1927. 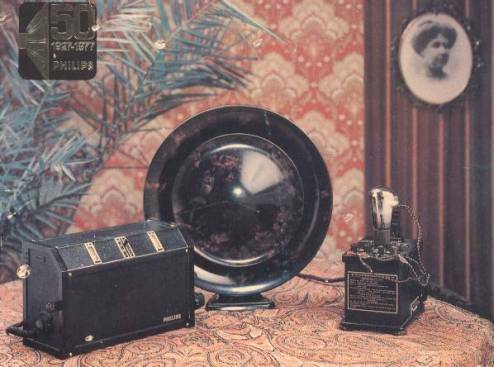 The Philips radio type 2501 (left) is a three-valve plus rectifier receiver. Its internal power unit provides only the heater and bias (hence the rectifier) supplies. The rectifier unit on the right, type 372 supplies the HT of 150 V. The loudspeaker type 2006 dates from 1926. It is a moving-iron type with a palarised magnet system and has an impedance of 1500 to 2000 ohms.